Note: These photos are after they both had 3 baths each. One flea bath and then two medicated baths. I did not get pics before I started treating them….I was more concerned for how miserable they were. 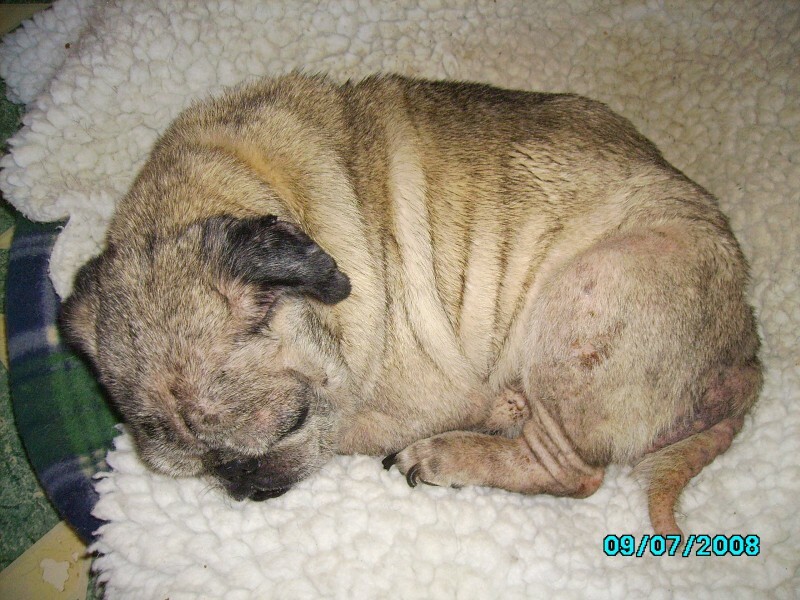 Missy came into rescue with Pugsly. She is a sweet girl who wants nothing more than to lay at your feet. A severe flea infestation had her skin raw and oozing, as well as hair missing on the back part of her body. At her vet visit Monday(8/8), she was found to be slightly anemic, severe skin infection and in need of a dental. She has some blindness in her left eye and it is our hope the eye meds we have her on may clear this up, but it is very possible this is caused by an accident or an underlying condition left untreated. Missy was heartworm negative and we will schedule her dental once the infections are cleared up. Pugsley, aka My Lil’ Ole Man is a tiny boy who came in with Missy. He is a sweet little boy who came to us in extremely poor health. A severe flea infestation had his skin raw and oozing, as well as hair missing all over his body. At his vet visit Monday(8/8), Pugsly was found to be very anemic, low thyroid (below .5), severe skin infection, and an urinary tract infection. By a miracle, he was heartworm negative. He appears to be almost completely blind. 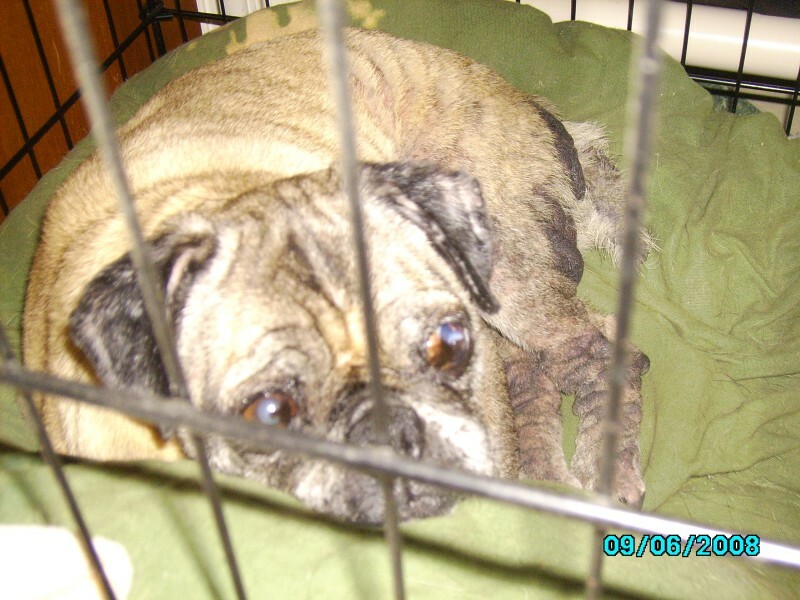 It is our hope the eye meds we have him on may allow him to regain a little sight, but it is very possible this is caused by permanent damage from either lengthy poor health, an accident or an underlying condition left untreated. Pugsly is missing at least half of his teeth and what he has are rotten to the point of being green. We cannot attempt to put him under for a neuter or dental for at least 4 weeks to get the various infections and his thyroid under control. It is possible that once the infections clear up, his thyroid may even out some. They spent their first two days in my care simply crying and scratching themselves until they was bleeding. I spent those two days simply doing everything possible to keep him quiet and comfortable. 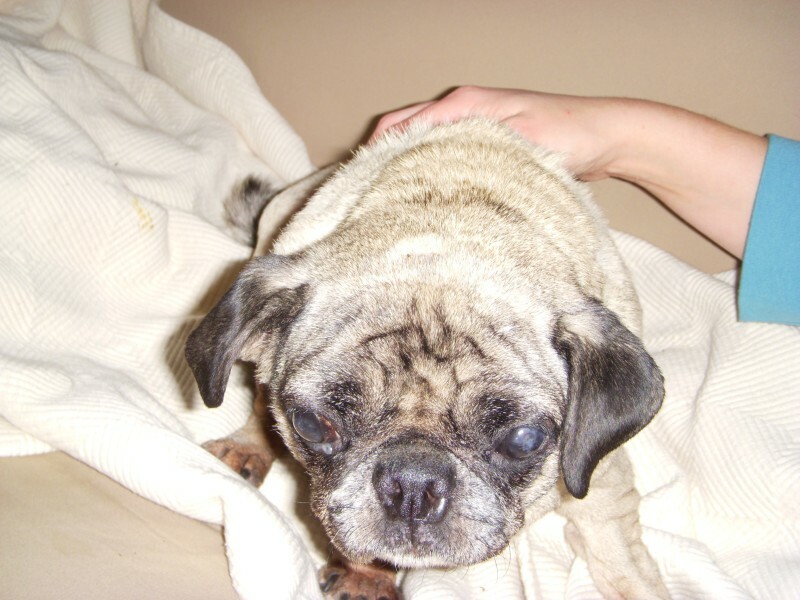 At this point we are evaluating both Pugsly and Missy to determine rather they are bonded to a point that they need to remain in the same home or if they may be adopted separately. As always, any and all donations to help offset medical bills for these precious babies are appreciated. Every penny counts and it is because of YOU, that we can give these furbabies the life they deserve. Maggie had been rescued by a neighbor of her original owner. Through mutual contacts a fellow pug lover found out about Maggie (formally Bella) and went to see this sweety for herself. After seeing the pain this little girl was in, she immediately contacted MAPR for help. From what we can tell, her human mother passed away and the husband was abusive to Maggie in that she was thrown against a wall, cigg burns on her head, etc. Valarie, thank you for helping to save Maggie’s life and putting her on the road to a life she deserves.